The VMware VIX API in my opinion is still one of the most powerful and undervalued API's that is available to customers and partners for Virtual Machine guest operating system Automation. The VIX API allows you to perform guest operations such as starting/stopping an application, file/directory manipulation, uploading/downloading files all within the guest operating system without requiring any network connectivity to the Virtual Machine. This is all made possible through the use of VMware Tools that is running inside of the Virtual Machine and operations are only performed after a user of the guestOS is properly authenticated. The VIX API was first introduced as a separate client API supporting VMware's hosted products such as VMware Fusion, Workstation and Player and later supported VMware vSphere. The API was quite popular for the hosted products and with the release of vSphere 5.0, the VIX API was finally integrated into the vSphere API to provide a single API that could manage all aspects of vSphere as well as these new guest operations APIs for your Virtual Machines. 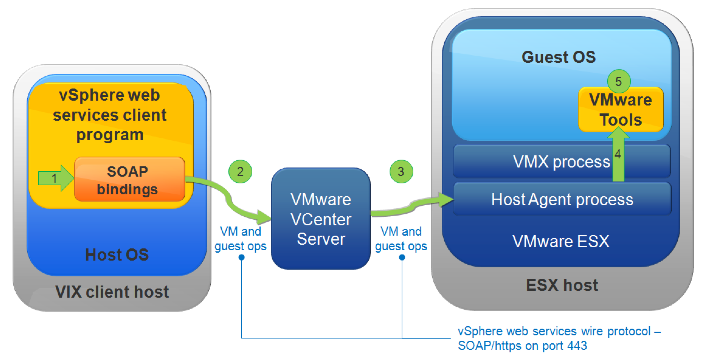 With this integration, these new APIs are now known as the vSphere Guest Operations API. If you are familiar with the VIX API and would like to move or migrate to using the new Guest Operations API within vSphere, there is a really useful whitepaper that I recently came across called Transporting VIX Guest Operations to the vSphere API that provides a nice mapping of the API methods between the VIX and new vSphere Guest Operations API. The whitepaper also includes various code samples using Java, PowerCLI cmdlets and vSphere SDK for Perl to demonstrate the new Guest Operations APIs. I think every vSphere administrator or developer should be familiar with the capabilities of the VIX and Guest Operations API and how it can help them further automate and manage your guestOSes and the applications that run inside of them. VMware hinted earlier this year that the future of the VIX API would eventually be integrated into the core vSphere API, it looks like the wait is finally over. With the latest release of vSphere 5, the VIX API is no longer a separate API but consolidated into the core vSphere API which allows users to perform guest level operations directly to a virtual machine that is running VMware Tools. 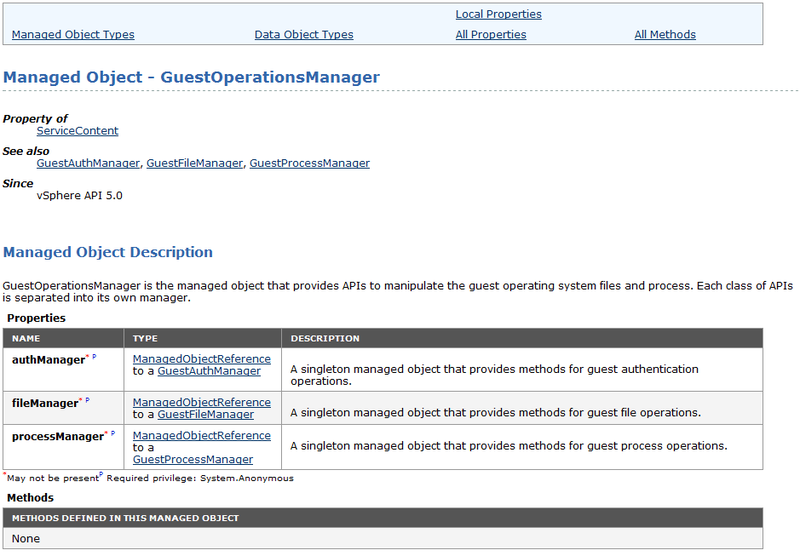 There is now a new managed object called GuestOperationsManager which provides functionality for Authentication (authManager), File management (fileManager) and process management (processManager). The API is actually quite easy to use as you need to first acquire a guest auth credential within the guest and then you can perform any of the various guest operations using this credential cache. I wanted to show the power of the VIX API by creating a vSphere SDK for Perl script called guestOpsManagement.pl that implements majority of the VIX/Guest Operations for users to manage from a centralized script. You will need to have a system that has the vCLI installed or use VMware vMA and to utilize the new VIX operations, your virtual machines must have the latest VMware Tools installed. 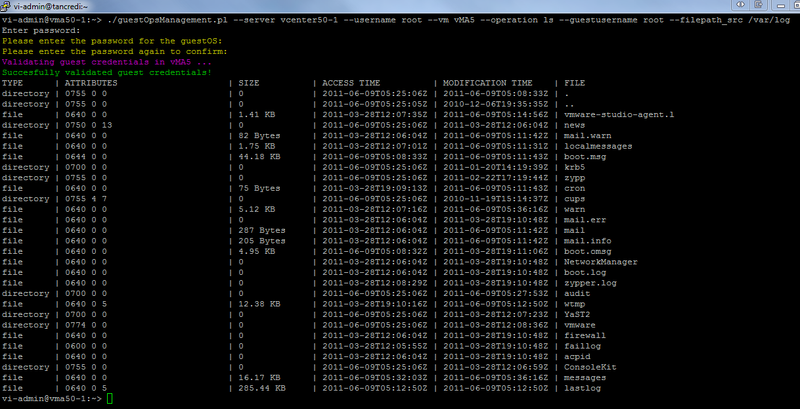 You can download guestOpsManagement.pl script here. In the next example, we will kill off the "tail" process as listed above.